Reductionism as a scientific methodology has been extraordinarily successful in biology. However, recent developments in molecular biology have shown that reductionism is seriously inadequate in dealing with the mind-boggling complexity of integrated biological systems. 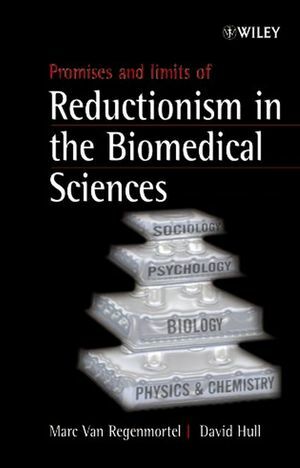 This title presents an appropriate balance between science and philosophy and covers traditional philosophical treatments of reductionism as well as the benefits and shortcomings of reductionism in particular areas of science. Discussing the issue of reductionism in the practice of medicine it takes into account the holistic and integrative aspects that require the context of the patient in his biological and psychological entirety. The emerging picture is that what first seems like hopeless disagreements turn out to be differences in emphasis. Although genes play an important role in biology, the focus on genetics and genomics has often been misleading. The consensus view leads to pluralism: both reductionst methods and a more integrative approach to biological complexity are required, depending on the questions that are asked. David L. Hull has been teaching philosophy of biology for almost forty years. He received his PhD from the Department of History and Philosophy of Science at Indiana University and has taught at the University of Wisconisn-Milwuaukee and Northwestern University. He has published a dozen books and anthologies and over a hundred papers. He is past president of the Philosophy of Science Association, The Society for Systematic Zoology and the International Society for the History, Philosophy and Social Studies of Biology. He is a fellow of the American Association for the Advancement of Science and a member of the American Academy of Arts and Sciences. Marc Van Regenmortel was for 20 years Director of the Immunochemistry Laboratory at the CNRS Institute of Molecular and Cellular Biology, in Strasbourg, France. Educated in Brussels, Belgium, he received his PhD degree (1961) in Virology from the University of Cape Town, South Africa and held professorship appointments at several Universities in South Africa and France. The author or editor of 14 books in virology and immunochemistry, he has published over 350 scientific papers and reviews. He is Editor-in-Chief of the Journal of Molecular Recognition and of Archives of Virology, an Executive Editor of Analytical Biochemistry and serves on the editorial boards of seven other journals. He was for nine years (1990-1999) Secretary General of the International Union of Microbiological Societies and for three years (1987-1990) Chairman of its Virology Division. He is since 1996 the President of the International Committee on Taxonomy of Viruses.